Back to the BLM land behind the VFW in Yuma, so Phil could get some dental work done in Mexico. I figured out that I've spent over 6 months in this place in the 13 years that I've been fulltiming. Pretty pathetic, huh? In spite of that, I still managed to find a couple things to see that I had not seen before. Last year the WINs went up to the Yuma Proving Grounds to see their museum, but it was closed. So Phil, Sally, and I headed up there to see it. During World War II, Gen. Patton used this unique sandy area to train troops to fight in North Africa. The U.S. Army Overland Train was developed to was developed to transport equipment and supplies over both on- and off-road terrains. The 565-foot long "train" was pulled by this monster engine. In order to maneuver over the sand, troops wore these snow-shoe type things. We're very close to the Algodones sand dunes, which presented a real challenge to early motorists. 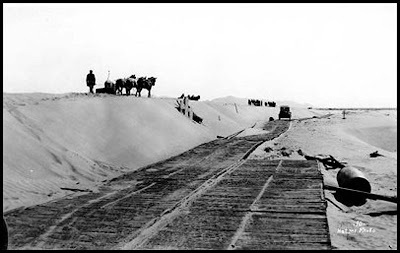 This "Plank Road", 7-miles long, was created to cross the treacherous dunes. Twelve foot sections were moved by horses whenever the dunes shifted. 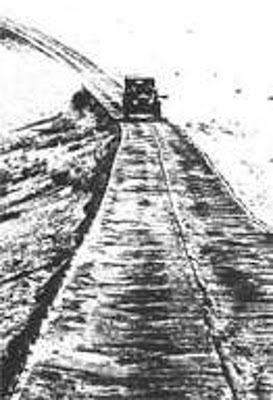 Turnouts (shown here) were provided every quarter mile so cars could pass each other. Believe it or not, a portion of the road is still visible. More info and directions to this amazing spot are here. The dunes were also used in the filming of "Return of the Jedi." Photos and the whole story are here. And we couldn't get much closer to Mexico! I'm back in Yuma temporarily - the Winter Lettuce Capital of the World. This area grows 90% of the lettuce eaten in the US! Last weekend was Yuma Lettuce Days. Sally and I went to check it out. First, we went on a bus tour of the local fields and learned all kinds of interesting stuff. The winter vegetable crops are just about all picked. For the summer, mostly wheat and cotton will be planted. All of it is irrigated with water from the Colorado River. I hope this guy is not going to try to go boating in the canal! Celery is a hard crop to grow, because each plant has to be individually transplanted. Watermelon and muskmelons are starting out here. There are also lots of date farms in the Yuma area. We learned a lot about them. There are male and female palms, and the females are hand pollinated, so that you only need one male palm for every 100 females. Back from the bus tour, we saw lots of big shiny machines. This cotton picker can pick 4 acres of cotton in one hour! Also an award-winning fruit and vegetable carver. Who knew there was such a thing? We also saw lots of these t-shirts - "Ask me why I am not naked or hungry." I guess the answer is all the vegetables and cotton that is grown here. Biosphere 2 near Tucson was a grand experiment in the early 90s. It is called Biosphere 2 because the earth is Biosphere 1. Eight researchers/guinea pigs sequestered themselves for 2 years inside the air-tight sealed facility. Each one had their own small two-story apartment. And used a group kitchen/meeting room. They raised all their own food. They complained of constant hunger the first year, but managed to grow more food the second year. Zacry gave us a great tour. According to him, the project was a huge success, but if you read about it on the Internet, there were some big problems. One was dropping oxygen levels, which finally had to be artificially elevated. We went down a long tunnel to get to one of the 2 "lungs." Because the facility was sealed, it needed a way to breath, or it would explode as the air pressure increased when the temperature rose each day. The 2 domed lungs expanded and contracted to adjust for the change in pressure. You can see here the feet that it rests on are off the ground. The outside of the lung with a nice Texas Mountain Laurel in the foreground. They advertise that Biosphere 2 is one of the 50 must-see wonders of the world. While it was very interesting, I wouldn't rank it quite that high. A highlight of the Tucson area, the Desert Museum boasts a variety of attractions, from animals you would find in a zoo, such as this Mountain Lion, to beautiful plants and cactus. The Bighorn Sheep were also pretty cooperative about getting their photo taken. But the highlight of the Museum are the Raptor Free Flight programs. A lot of my pictures look like this. These animals are flying free, but trained to go back home when their part of the show is over. First out in the morning show was the Chihuahuan Raven, slightly smaller than the Raven we usually see. 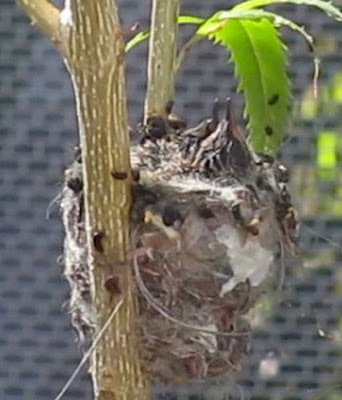 The trainer would put pieces of food on different branches, and the birds would land there, or on her arm. Next up was the Gray Hawk, I think. Since I didn't take notes, I hope Judy will tell me if I misspeak. Then came the Great Horned Owl. He was a little spooked by a photographer from PBS who was not where the birds are used to seeing people. And a Ferruginous Hawk. They all flew from branch to branch right over our heads, seemingly oblivious to our presence (with the exception of the PBS photographer). And the rattlesnake. I was glad I was back in the fifth row. Then after lunch there was another fascination Raptor Free Flight, this one all on the Harris' Hawk. There are 3 of them in the group, and they hunt cooperatively and are supposed to share their food. During the presentation, 2 of them took off to hunt, and one came back with what looked like a small bird. 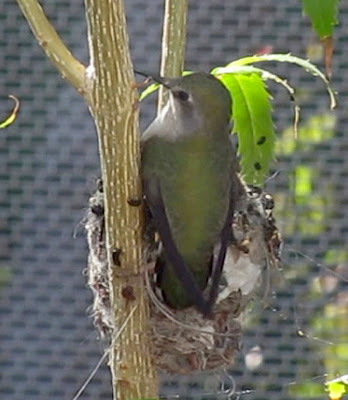 Another highlight of the park was the Hummingbird Aviary. The birds are nesting at this time of the year. 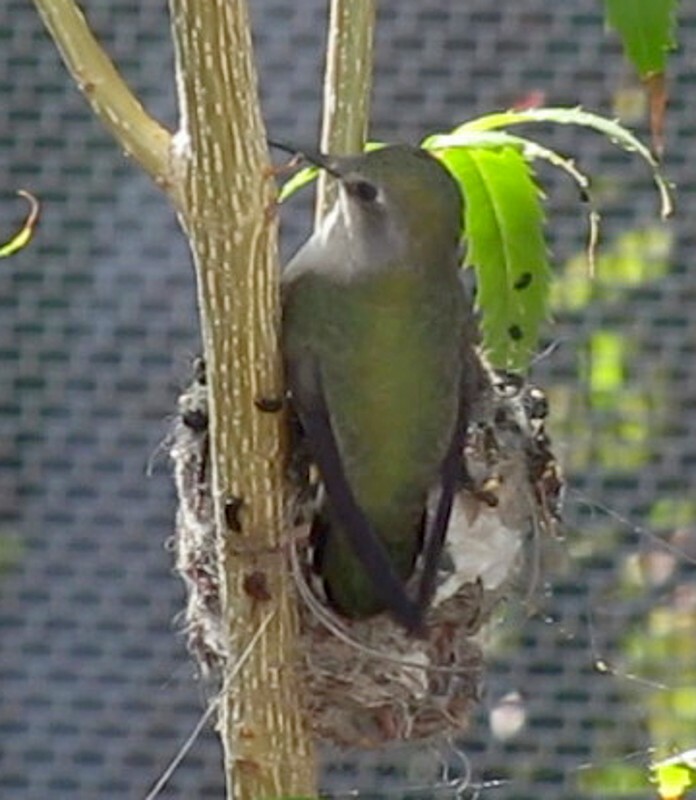 This is an extremely short video of mommy feeding the babies. Nearby was a baby from another nest who had just left the nest the day before. It was a great day, and I recommend a visit to anyone who is in the Tucson area. In addition to 4 casinos that have free parking, Tucson has lots of goodies to see. After settling in at Casino del Sol, the first thing on the agenda was Saguaro National Park. The wildflowers were starting to bloom, including the yellow Brittlebush and the pink Fairy Dusters. There were a lot of saguaros in the park, but I think I've seen more in other places. It seems they have had some deep freezes here that have killed alot of the cacti. More Fairy Dusters, along with cholla and prickly pear cactus. We found a crested saguaro, with a little help from the ranger. Not the best example, but it was right along the road and easy to find. We stopped for lunch where various wildlife fought over our crumbs - here a ground squirrel and gila woodpecker. One of the most beautiful things to see around here is the Mission San Xavier del Bac - the White Dove of the Desert. Jesuit missionary, Father Kino, began building the foundation for a Catholic mission in 1700, but it was not completed then. It was finally built between 1780 and 1797. No one knows why one dome is not finished, but one popular legend suggests that early taxation laws exempted buildings under construction, so the builders chose to leave one dome unfinished. And in the alcoves on either side. I tooke these photos with my tiny Canon 300HS. It was very dark inside, but the Canon has a setting called "Handheld Night Scene." It takes 3 shots in a burst and somehow adds them all together, reducing the shutter speed and the ISO required in such low light. I don't really understand it, but it's really cool. I can't go in a Catholic church without checking out the Stations of the Cross. They are frequently very unusual, especially in old missions. Here they were outside, in a beautiful cactus garden. More on Tucson to come!